I constantly read about how to improve our worship at Crossroads. As Americans I think the majority of us hope to participate in as many fulfilling activities as possible - while being unwilling to invest in little that requires work and discipline. I know, because it's true for me many times. Although I understand not everyone is comfortable raising their hands and joyfully clapping and singing during the worship services - to fully engage in worship would at least produce the moving of lips I suspect. As the leader of this department I seek to move each person in our congregation to the next level of spiritual abandonment in Christ - whatever that is for them. It HAS to begin at home - we cannot accomplish this in a half hour worship service each weekend no matter how hard we try. What i need to work on the most is to ensure our praise team is maturing in Christ and living a worship life outside the walls of church. If a Godly life is not pursued outside of Crossroads- hours of memorization and practice could mean little more than fulfilling a call to serve. Will you join me on this journey of worshiping our Lord? 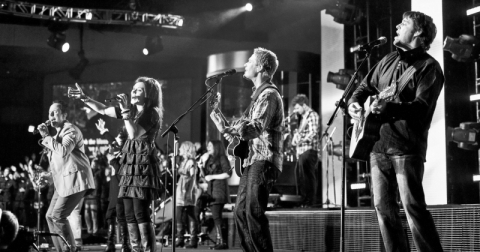 Gateway @ Crossroads/ July 30 at 7:00 p.m.
A rare opportunity exists on July 30 at Crossroads when the Gateway Church comes to lead us in a Night of Worship. Will you mark your calendars and let nothing interfere with your commitment to worship with us on that Tuesday evening? I cannot wait to worship with all of you there!